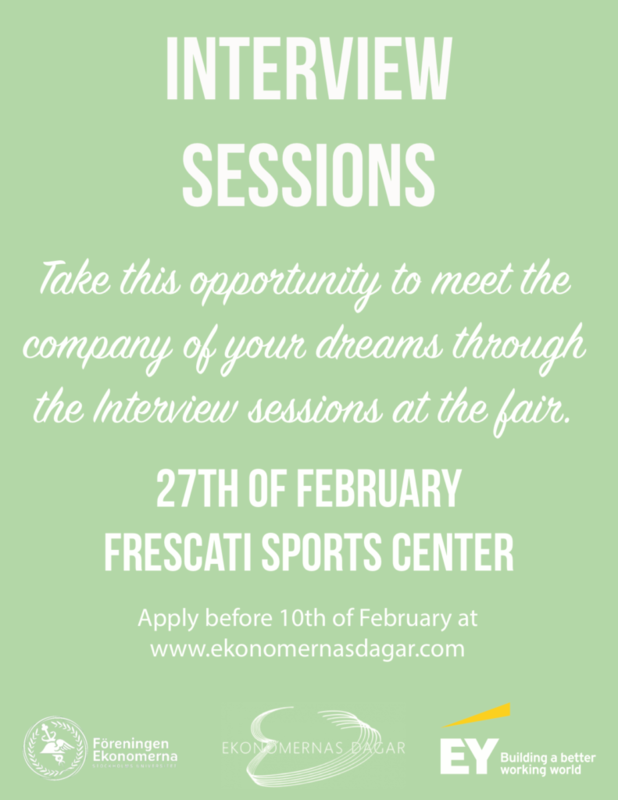 Ekonomernas Dagar 2019 presents, Interview Sessions! Take this opportunity to meet the company of your dreams through the Interview sessions at the fair. An interview session isn’t necessarily a job interview, it is rather a relaxed conversation giving both students and companies the opportunity to get to know each other better. This is the perfect time for you to ask the questions you have always wanted to ask. Take this chance to extend your network and market yourself in a relaxed setting with representatives from different companies exhibiting at Ekonomernas Dagar. Each interview session is 20 minutes long and you can apply for more than one session, with more than one company. The list of companies will continuously be updated so keep an eye on the application even if you have already applied – you can always apply again! The deadline to submit your application is the 10th of February.